Bike Happy Month is a crowdsourced, DIY festival of fund bike rides & activities to close out Seattle’s Summer. All people are encouraged to create their own fun rides, parties and events in celebration of bicycling and post those activities on a community calendar on this website to recruit people to join them. Held on the very last day of Bike Happy Month (and the day after the last day of summer), Pedaler’s Fair is an all-day street party to celebrate the end of Bike Happy Month and the summer. Held in Ballard, Pedaler’s Fair incorporates the Cascadia Handbuilt Bicycle & Bike Goods Trade Show, Flatstock bike poster art show, food truck pod, Ballard brewery passport, live music, and bike-related workshops and presentations. The heart of the Pedaler’s Fair is the Cascadia Handbuilt Bicycle & Bike Goods Trade Show. It’s is an annual marketplace for Cascadia-based, bicycle-inspired small businesses to exhibit their goods. The event will host 50+ exhibitors showing off their bike frames, components, accessories, apparel, and crafts. In addition to exhibitor booths, there are tutorials, workshops, presentations. 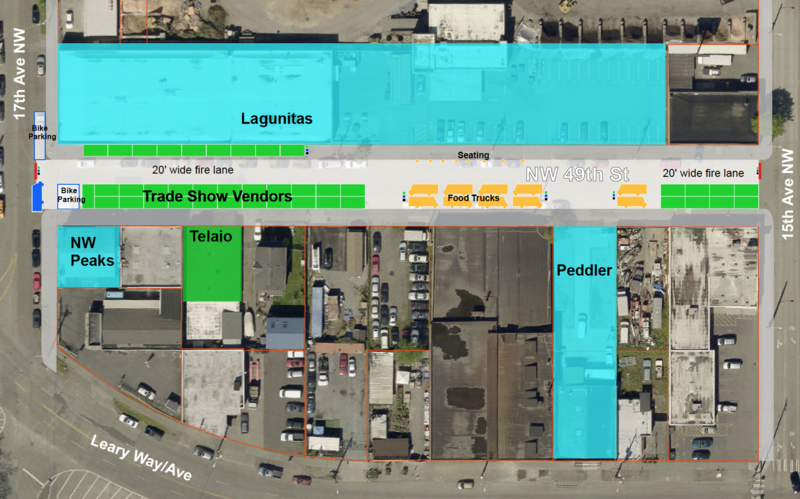 The adjacent breweries to Pedaler’s Fair, which include Peddler Brewing, NW Peaks, and Lagunitas Brewing, will have a selection of beer from other Ballard breweries and people will be able to stamp a brewery passport to mark which beers they’ve tasted. A food truck pod of eight-to-ten food trucks will be in the middle of the street party, providing whatever food options your heart desires. Listen to local bands play all day in the outdoor yard of Peddler Brewing. Bike-themed presentations, workshops, and trainings. Bike shops to fix your flats or give your bike a quick tune-up.